Requirements: Android version 4.2 or up. 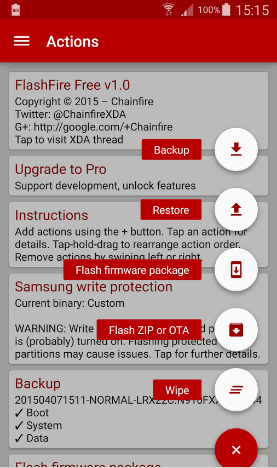 FlashFire Apk is a popular android application which is used for flashing firmware for rooted device. Flashfire is the most advanced firmware flasher which is capable of flashing complete firmware packages from various manufacturers with the application of over the air (OTA) and zip updates. It performs all of these functions without disturbing the maintenance of root and without using the custom recovery. FlashFire app also allows backups and restore feature. You can also save its relevant files on your SD card, or internal storage or you can transfer them to your PC through USB cable or wifi. easily. FlashFire is the spiritual successor to the Mobile ODIN app, which was a similar solution (using completely different methods under the hood) exclusively for Samsung devices on older Android versions. It is one of the most advanced on-device firmware flasher for rooted android device which can flash full firmware packages. FlashFire works absolutely smoothly on rooted device and performs its function while maintaining root. FlashFire Also offers complete device backup and its restoration in several different formats. It is one of the most trusted android flasher for firmware. You can also store relevant files on SD card, internal storage or can move them between your device and PC through USB or wifi. FlashFire is an extremely powerful app that can cause serious destruction to your device if, you are not expert in its use. It can cause Data loss, oft-bricks, and even hard-bricks, So make yourself completely satisfied before using it. It’s also suggested to have a chat with experts on XDA discussion Thread before making any changes with this app. Note: Currently all the Pro Features are available in the free version of FlashFire. This may change soon, so get benefit of it now!